Signing up for notifications in Kanbanize allows you to keep track of your team's activities and your own work items. You have the option to subscribe only for notifications, you are interested in. Note: Notification settings are configured per board! To configure your notifications -> go to the Notifications tab (3) at the top right of your screen -> click on Settings. When you open the Notifications panel -> use the Select board dropdown to define the board for which you wish to receive notifications. In Kanbanize, there are two types of notifications: System notifications (In App) and email notifications (Email). Choose the actions for which you wish to receive notifications (e.g. 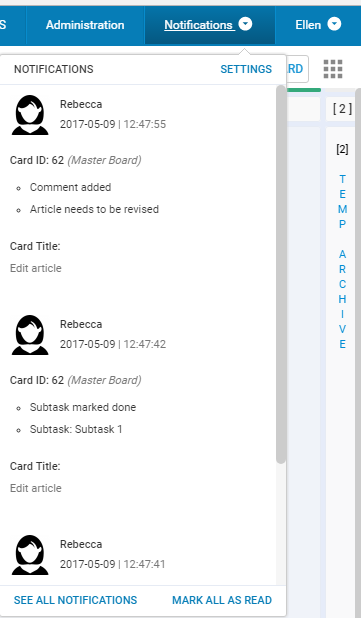 "creation of card", "card is assigned to me", "card is blocked", "comment is added" etc.) by selecting the corresponding check box -> Click on Save notifications settings. - only receive notifications for cards, where you're an assigned or a contributor. 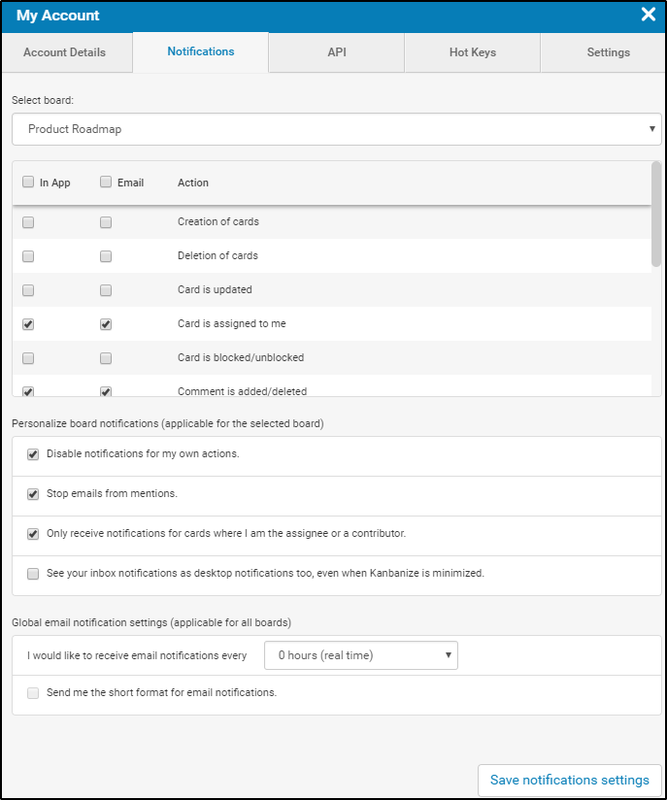 This feature allows you to receive your email notifications in batches and to define how often you want to receive emails so that you don't get distracted from your work. Choose the intervals in which the notifications to be sent to your email: once every hour, 2 hours, 4 hours, 6 hours, 8 hours, 12 hours or once a day, by using the dropdown in the Global email notification settings. If you set up this option, it will be applicable for all boards you are assigned to. The batch notification option is available for the email notifications. When set up, you can also choose to receive the short format of the email notifications. There are two types of notifications: "In App" and "Email" notifications. The " In App" notifications are displayed as a number in a red circle on the Notifications button itself. - When you click on it, the system will display the corresponding cards/actions. If you don't want to receive any notifications-> go to Notifications -> Settings -> deactivate all checkboxes -> click on Save notifications settings. Why do I still receive notifications? 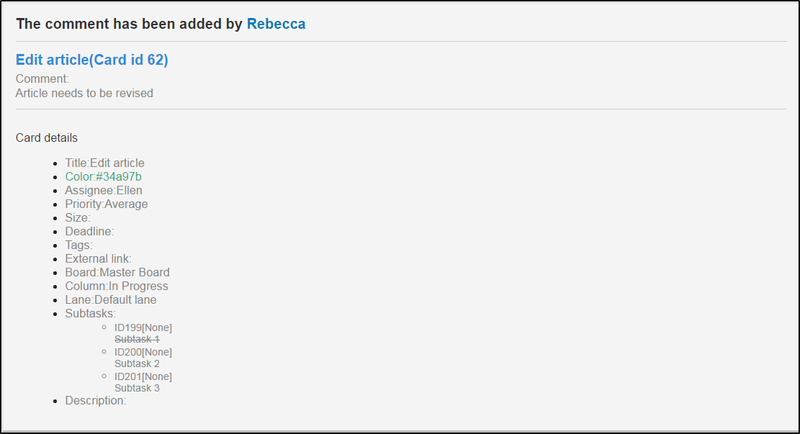 Check, if you have unsubscribed for all boards you are assigned to, as the notification settings are per board. Check, if you are assigned as a card watcher. Card watchers receive notifications even if they have unsubscribed for the notifications on the board. Check if there is an active Runtime Policy, which is set to send you notifications when certain events occur.